Posted on Fri, Jun 21, 2013 : 12:16 p.m.
Michigan-based venture capital firm Huron River Ventures announced the closing of its first fund this week. The firm, which operates offices in Ann Arbor and Grand Rapids, capped the fund at $11 million. Tim Streit (left) and Ryan Waddington founded Huron River Ventures in 2010 with an eye towards investing in Michigan startups. “We started working on this fund in 2010 and we had our first close at $7.5 million in March 2011,” managing director Tim Streit said. Venture capital funds typically have “life spans” of about 10 years, Streit said. The first five or six years after the closing of a fund are spent investing in companies and the last four to five is considered a “harvest” period. “We’re a little over two years into a 10-year fund and we’ve deployed about 30 percent of our capital, so we’re about on pace,” Streit said. Streit said the firm typically makes investments in the low hundreds of thousands in early stage companies, but holds a significant amount of additional capital for add-on investments. Once a firm is invested in a company, it is often invited to participate in later rounds of funding which can maintain or increase its equity stake in the startup. 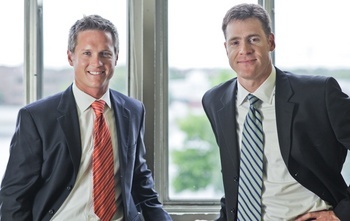 The recently closed fund is the first for the VC firm founded by Streit and Ryan Waddington. The pair met at the University of Michigan where Streit was an undergraduate student and Waddington was getting his masters degree at the business school. The fund’s focus on Michigan companies helped it receive $6 million from the State of Michigan as part of the Accelerator Fund Program. The program is administrated by the Michigan Economic Development Corp. with money from the Michigan Strategic Fund. The goal of the program is to seed early stage venture capital funds that focus investment on Michigan companies. Streit said his firm fits the bill. “We’re a perfect fund for Michigan,” he said. While the firm initially billed itself as “clean tech” venture capitalists, Streit said the term has been so misunderstood that he now explains their focus different. “We’re particularly interested in enterprise and business-to-business software that makes things more efficient,” he said. The fund’s current portfolio includes Ann Arbor-based companies FarmLogs and Covaron Advanced Materials. The company is looking to make further investments, and hopes that having a closed fund will help develop new leads. “Announcing that the fund is closed is a formality,” Streit said. Sat, Jun 22, 2013 : 3:03 p.m. These guys are front loading small business owners using other peoples money while promising to pay everyone back overtime while they siphon off a portion for themselves. The hope is one of the 30 or so companies &quot;they invest in&quot; will hit it BIG. Mon, Jun 24, 2013 : 4:47 p.m.
That's how all venture capital works, except for the fact about 'small business'. Venture capital is high risk, high reward investments in companies that significantly disrupt norms, not niche businesses. Sat, Jun 22, 2013 : 12:32 p.m.
GoNavy, I am familiar with the state program that invested in HRV. The state is an investor and will enjoy the gains and/or suffer the loses of the fund. The program did offer an incentive for other investors to commit to the fund by capping the state's return to 150% of the state's commitment, meaning if the fund does very well the investors other than the state would get slightly more return than normal. FYI, many funds have funding from government entities, it is part of a diversified investment model and not really news. When HRV secured the Accelerate Michigan award it was in the news along with the other awardee that received an investment out of Grand Rapids. Sat, Jun 22, 2013 : 2:41 p.m. Sat, Jun 22, 2013 : 11:42 a.m. I was very interested in this piece, and the two founders, until I learned that the majority of their capital came from the state. At that point, it became important for me to learn what the state - not these two - would be earning in return for its investment. What terms were offered? Are there shared gains and losses, or just shared losses? Perhaps more on the main investor of interest in this case, the Taxpayers of the State of Michigan.